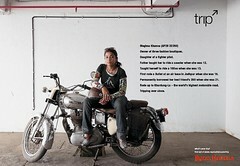 You are here: Home / Advertising / Royal Enfield: what are you tripping on? Royal Enfield: what are you tripping on? For bikers, Royal Enfield is a brand that is likely to set their pulses racing. Not exactly on the same league as Harley Davidson, I would imagine but pretty much a cult brand. With its rich history and Owners Clubs its got some mystique about it alright. Apparently, Royal Enfield is a brand of the Enfield Cylce company which also produced rifle parts. Rifle, bullet…I get the drift. In India, the brand has been in the news of late largely in the unpaid media. Their CEO was profiled as bike enthusiast and this low profile also helped in building the Enfield mystique. They have recently launched a new print campaign in India, created by W+K, Delhi. Adrants has a tongue-in-cheek review about the campaign. Such campaigns only work if they give you gooseflesh. If the objective is to portray the user as someone different, someone who you wish you were, someone who you look up to or identify with then it helps the brand cause. I felt this series of ads fall flat on the above scores. This is not gooseflesh stuff. 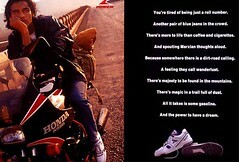 It only furthers the notion that this is a marginal, nice brand something that a mainstream biker would not consider. I am willing to be corrected by bikers and pundits. On a similar note, ages ago there was a campaign for Power Shoes from Trikaya Grey. Similar stuff – portray the protagonist as someone different, someone who people could look up to. You’re tired of being just a roll number. Another pair of blue jeans in the crowd. There’s more to life than coffee and cigarettes. And spouting Marxian thoughts aloud. Because somewhere there is a dirt road calling. And a feeling they call wanderlust. There’s majesty to be found in the mountains. There’s magic in a trail full of dust. And it takes some gasoline. And the power to have a dream. Hey, this could work for Royal Enfield. End of this trip. Speaking as someone who has been biking across anything that can be ridden on ( and a fair many surfaces, that I had no business riding on ) I have to agree with you , with a resounding Booyaa ! Whoa! Spoken like a true biker. Sometimes agencies mistake a pretty layout or a good looking ad to be the end-all. In categories where the involvement is high one needs to straddle between appealing to the users and the wannabes. If it didn’t move the users like you, little chance it will move the Wannabes.